Israel’s Jewish voters and the Israeli right are apparently concerned about the impact of the Arab vote in next week’s election and see it as an influencing factor. Prime Minister Benjamin Netanyahu is fighting for his political life, using provocative anti-Arab campaign slogans and themes to fearmonger his right-wing supporters into coming out to vote. One of those slogans, embraced by Netanyahu himself, is “It’s Tibi or Bibi,” a reference to his nickname, “Bibi,” and the surname of one of the leading Palestinian Knesset members, Ahmad Tibi. The idea is that, if Israelis don’t vote for him, they will instead get Tibi forging the country’s future, which would give Arabs greater leverage over Israel’s policies and even slow the pace of illegal settlement construction. This is really ironic. While the Israeli right is fearmongering to get its voters to the polls in the hope of giving Netanyahu another term as prime minister, Palestinians are doing just the opposite. They are largely lethargic, apathetic, uncaring and unmoved. Polls suggest that many Palestinian citizens, who represent about 20 percent of the population, will not vote and their collective voice in the election will be weak. Turnout might be even lower than the 2015 election, resulting in even fewer Palestinians serving in Israel’s parliament. 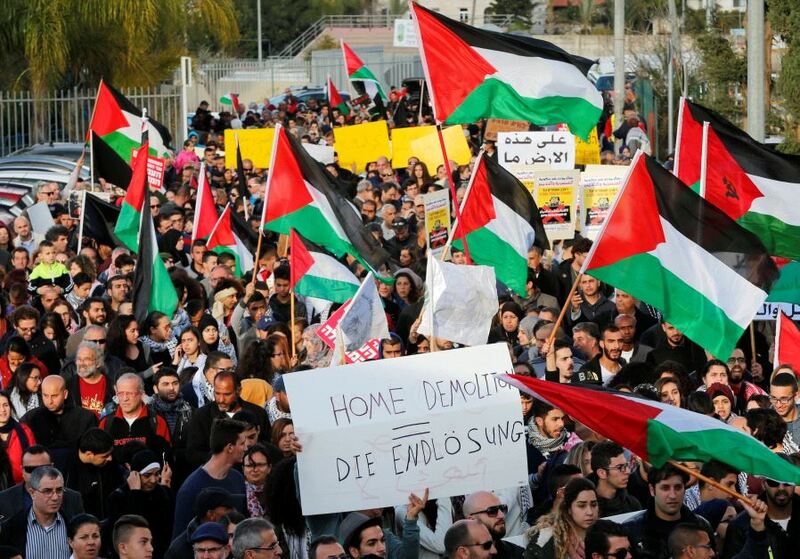 A poll conducted by the Yapa Institute and summarized this week in Haaretz, the left-leaning English language newspaper, concluded that “half” of Palestinians who could vote in the April 9 election will not. That would represent a significant drop from the last election, when 63 percent voted and Palestinians achieved their largest ever representation in the Knesset of 13 members. That is shocking to me. Every week we hear tragic stories of Palestinians being murdered by Israeli army snipers along the border with Gaza. We hear about Israel’s government violating international law to pass legislation that undermines the rights of Palestinians in Israel; declaring illegally that Jerusalem is its capital; annexing occupied lands, such as the Golan Heights, in violation of the Fourth Geneva Convention; and stealing ever more Palestinian land to build illegal Jewish-only settlements. If Palestinian voters could be awakened, they could organize themselves into a powerful voice. Is there nothing that can prompt Palestinians to wake up and do something? They have several political parties that struggle in every election to ensure they have a place at the table where these and other illegal, racist laws are decided. Palestinians have historically failed to secure proportionate representation of their population in the Knesset, but they came closest to doing so in 2015, when all Arab parties came together under one banner called the Joint List. They were provoked to come together because the minimum threshold that a slate must receive to be allowed to sit in the Knesset was raised to 3.25 percent of the total votes cast. When you think about it, that motivation says a lot about the Arabs. We love to complain. We love to blame everyone else. We wrap ourselves in emotion and anger rather than roll our sleeves up and try to achieve positive change. Is it because we lack the faith that we can do it? We think so little of ourselves and our rights, our culture and our history that we are apathetic and we prefer to yell and be negative rather than do something positive? If the Yapa poll results are true, it reaffirms that the Palestinians are their own worst enemies; that they enable Israel’s policies of racism and discrimination by being uninvolved and staying at home on election day. The Palestinians have a powerful potential, and yet nothing seems to move them. They should be able to vote in 20 percent of the Knesset’s members — 24 out of 120. As an American-Palestinian activist and writer, I have seen this apathy at work. It is a factor that empowers the fanatics and extremists, who don’t need to achieve anything to stay in power. The extremists can be failures because the community is dormant, apathetic and undemanding of change, success or powerful goals. That is why the extremists have power. They use suffering like a narcotic to push the Palestinian public into a delirious state of do-nothing anger where, instead of fighting for their rights, they stay at home and suffer, and complain about not having rights. You have to blame the “leaders.” If we ever had a peace accord in which Palestinians were to get a sovereign state, the extremists would become unemployed. What would they have to scream about if Palestinians won their rights, won peace, and established a state? The first challenge for the Palestinians in Israel and in the diaspora is to wake up and end the state of suffering that we have allowed ourselves to enter. We need new leaders willing to work hard and find creative strategies to improve Palestinian lives, rather than just sit back and moan. If Palestinian voters could be awakened, they could organize themselves into a powerful voice. They could take control of up to 20 percent of the Knesset’s political power and change laws in Israel, perhaps erasing the 66 laws that discriminate against non-Jews. More importantly, they could take the leadership of the diaspora and bring together Palestinians from around the world, including those under occupation in the West Bank and East Jerusalem, and under imprisonment in Gaza. Palestinians could forge a powerful movement that could change their destiny. Or, they could just be lazy and stay at home on election day, sitting around sipping “kahweh,” puffing on “nargilas,” or playing “shesh besh,” while complaining about all of the terrible things Israel has done to them. Voting for the “Apathy Party” is a choice Palestinians can make if they truly don’t care.